Inaugurated on 15 November 2018, the Kenitra-Tangier line is the first high-speed line in Morocco. Its main objective is to link the biggest town of the country, Casablanca, to Tangier. This is the first stage of a project to create up to 1500 kms of new railway lines in Morocco. ArcelorMittal is proud to contribute to this high-level project with the participation of ArcelorMittal Europe – Long Products Rails & Special Sections, who provided rails, and WireSolutions, who provided fences. On 14 November, ArcelorMittal participated in the first Polish Steel Day, organised as part of the Build With Steel initiative managed by the Polish Chamber of Steelwork and partners at the Warsaw Sheraton hotel – an event dedicated to investors, architects, designers, and general contractors to promote steel in the construction market. Do you want to enhance your building project? Learn how Steligence® will help lower the environmental impact, optimise space and height, speed up construction, and allow for greater creativity! Blachdom Plus, a producer of steel roofing solutions in Poland, has tested Granite® Ultramat from ArcelorMittal Europe – Flat Products. This is not the first time the company has run real-life production tests on new products from ArcelorMittal. For Blachdom Plus, trials such as this give them early access to solutions that will be attractive to their customers and a competitive advantage when it comes to understanding the technical performance of the material. Nowadays we personalise everything… Our cars, our furniture, so why not the roof over our head? Steel roofing solutions are growing in popularity as architects, designers, and homeowners seek out modern alternatives to traditional materials. New high-rise buildings brochure available! A new high-rise buildings brochure from ArcelorMittal Europe - Long Products Sections and Merchant Bars is now available. New Constructalia now available in Italian! 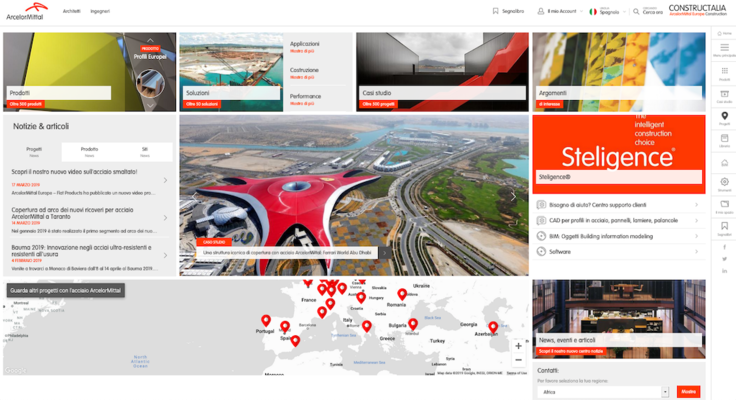 Discover the new website from ArcelorMittal Europe – Long Products Sections and Merchant Bars, which was recently launched in its English version. 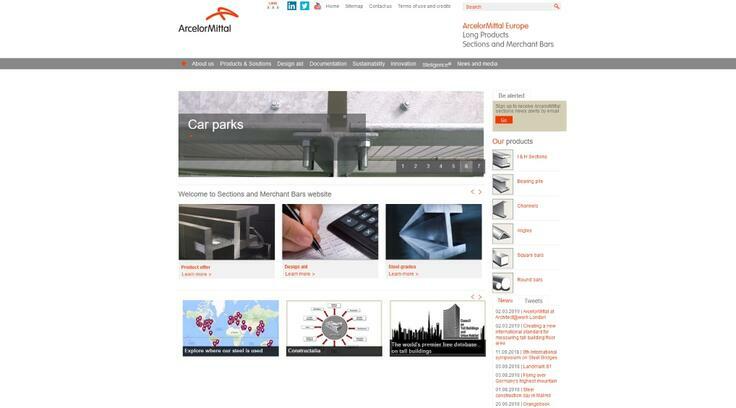 All of the information about structural profiles and merchant bars manufactured by ArcelorMittal is available in a new design! In January 2019, the first arch segment of the new ArcelorMittal (previously the ILVA metallurgical plant) steel shelters in Taranto, Italy were erected. Each segment is composed of six of a total 51 huge arch trusses that will form the 80m high, 254 m wide, and 700 m long cover structure which is required for the environmental containment of the Mineral Park. Heavy plates from our Taranto mill were used for the fabrication of the welded tubes and trusses. The third arch in the Mineral Park superstructure was erected 10 days ahead of schedule – on 5 April! This structure will play a crucial role in limiting the dispersion of dust towards the city, particularly in the Tamburi district. The minerals present in the primary parks are due to be covered by the end of 2019 – almost 19 months ahead of the deadline set by the Prime Minister’s decree of September 2017. The coverage of the mineral parks is not only one of the most important interventions required by the Integrated Environmental Authority, but also part of the most ambitious environmental plan ever with a total goal of 1.15 billion Euro in investments by 2023, making Taranto the most advanced facility in Europe. The Moroccan rail operator ONCF*, via the local provider/installer Menasteel Industry, has entrusted the supply of WireSolutions’ high security fencing Atak®, produced in our plant in Bissen, Luxembourg. Our fences were installed along the north part of the line. This represents 50% in terms of volume (of the north part of the line) and 146 kms of fences. This is the first entry into the public market in Morocco for Bissen and a good opportunity to become an important player on the North African market. The line between Casablanca and Tangier is the first step in ONCF’s project to create 1500 kms of railways in Morocco. It will significantly reduce travel time from Casablanca to Tangier from 4 hours 45 minutes to around 2 hours. The 200-km track between Kenitra and Tangier is linked to the existent rail line between Kenitra and Casablanca. With trains running at a speed of 320 km/h, it is now possible to travel from Kenitra to Tangier in only 47 minutes. In the future, the line will be extended to the south through Marrakesh to Agadir, and another line is planned from Rabat through Fez to Oujda. About 130 people from the business and academic world gathered at the Warsaw Sheraton hotel for this first Steel Day in Poland. The event consisted of talks by specialists from production, galvanising, and design companies, and lectures given by well-known architects and representatives of industry associations. Different topics were discussed such as: new technologies in the galvanising industry, modern steel and composite bridges, and construction of the world’s largest mobile structure – the Chernobyl sarcophagus (made of ArcelorMittal steel). ArcelorMittal was represented on the Technical Committee by Marta Dziarnowska, International Steel Promotion Director at ArcelorMittal Europe – Flat Products, and Wojciech Ochojski, Technical Advisor at ArcelorMittal Commercial Long Poland sp. z o.o. As construction was the focus of the event, Steligence® was also in the spotlight with a mini stand, including a video display, as an introduction to this concept. Steligence® is ArcelorMittal’s radical new concept for the use of steel in construction, which will facilitate the next generation of high performance buildings and construction techniques and create a more sustainable life-cycle for buildings. As explained by Tomasz Plaskura during his speech: “We already know that steel is an ideal material to create functional and aesthetic constructions, but it is also important to make others as passionate about steel constructions as we are because steel is beautiful…The Steligence® concept has the potential to drive significant architectural and sustainability benefits. It will also impact the cost, which will be reduced…ArcelorMittal’s new headquarters, which will be built in Luxembourg, is an excellent example of this concept”. The Steligence® concept is enabled by the latest development in steel solutions such as building columns, castellated beams, composite slim-floor beams, additive floors, architectural panels, profile claddings, cassette systems, and many others. You can view more details at steligence.arcelormittal.com/products. Polish Steel Day was a great networking opportunity for people from different areas: architects, engineers, students, and academics and we look forward for the next edition. Steligence® proposes a new approach to construction which considers buildings holistically, almost as ‘living entities’. As such, this new science-based methodology proposes the need for more dialogue between various specialist architectural and engineering disciplines recognising not only specialist expertise, but also the positive impact of enhanced co-operation between experts. The concept has the potential to resolve the competing demands of creativity, flexibility, sustainability, and economics. Built into the Steligence® approach is a broad range of steel products for construction which individually add value, but together represent a compelling portfolio. The Build With Steel initiative was developed in cooperation with some of the most important steel companies in Poland. Build With Steel is the answer to the industry’s expectations for increasing the use of steel in the building industry. Steel as a material characterised by great flexibility and durability deserves proper promotion. The Build With Steel initiative is addressed to all key players in the construction market including students and graduates of technical universities, designers, architects, as well as investors and general contractors. The first tests on Granite® Ultramat were carried out by Blachdom Plus in October 2018 though preparations had begun months before. The test coil was produced at ArcelorMittal Eisenhüttenstadt, Germany and shipped to Poland. Piotr Szafarczyk, the ArcelorMittal client technical support manager for Blachdom Plus, travelled to the customer to observe the trial. Blachdom Plus also carried out bending tests on equipment used to produce flashings and on production lines for trapezoidal sheets and ridge tiles for roofing applications. Samples of the material Blachdom Plus processed were sent to the ArcelorMittal Global R&D team so several scientific tests could be performed. Granite® Ultramat’s resistance to corrosion is RC4, while its resistance to UV light is RUV4. Blachdom Plus is a producer of coated sheet products for roofing and facades. Formed in 2006, the company is based in the province of Silesia in southern Poland and employs around 120 people. Blachdom Plus has two production plants in Poland in Rybarzowice and Wrocław. The two plants include seven lines for roof tile profiling, six lines which profile trapezoidal sheets, and two lines to produce standing seam roofs. While Poland is the main market for Blachdom Plus, the company also exports to the Czech Republic, Hungary, Slovakia, and other countries. Blachdom Plus also operates 22 sales branches and has an extensive network of independent distributors in Poland and abroad. The company now offers five Granite® finishes including Deep Mat, HDX, Quartz, Standard, and Storm. Granite® Ultramat is the latest addition to ArcelorMittal’s Granite® range of organic coated steels for outdoor building applications. • Designed specifically for roofing. • Advantages over standard Granite® Deep Mat and competing products thanks to the high quality and flexibility of the paint system used. • Wrinkled finish, available in 11 colours. • Good formability at low temperature and after cold storage. • ArcelorMittal Europe – Flat Products is expected to offer guarantees of up to 20 years on non-perforation and up to 15 years for non-delamination. Granite® Ultramat’s aesthetic properties are expected to be guaranteed for up to 10 years. ArcelorMittal Europe – Flat Products has a new video on our latest innovation for roofing applications: Granite® Ultramat. It is a robust and long-lasting pre-painted steel which is flexible at low temperatures and offers a much wider range of aesthetics than traditional ceramic or zinc roofs. Moreover, it was just awarded a Golden Medal at the Budma fair in Poland. Roofs made with Granite® Ultramat require low maintenance, which reduces the cost - an important asset for young families building a new home. This is just a glimpse of the advantages... Check out this video showing the possibilities of a steel roof. ArcelorMittal FCE Celik Ticaret A.S.
ArcelorMittal International Celik Dis Ticaret A.S.
ArcelorMittal Commercial Long Çelik Deş Ticaret A.Ş. ArcelorMittal Commercial Long Sweden A.B. ArcelorMittal Commercial Long Romania S.R.L. ArcelorMittal Commercial Sections France S.A.
Arcelor Mittal Commercial FCSE Greece Ltd.